You may not have noticed but, especially if you live in the Northeast, you were getting something for nothing. Soon you will be getting less of that something, that is, you will be getting less CO2-free electricity from nuclear power plants. Nuclear power plants produce zero emissions, no mercury, no acid rain, no CO2, but in wholesale power markets they have trouble competing against generation fired by natural gas. Over the last month, two more nuclear plants fell victim to those market conditions. Entergy said it plans to close its Pilgrim plant in Massachusetts by 2019 and its FitzPatrick station in New York by 2017. 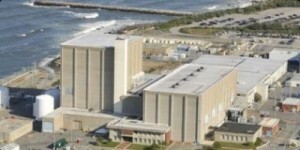 Those closures join a growing list of planned nuclear retirements, including Entergy’s Vermont Yankee, Southern California Edison’s San Onofre Nuclear Generating Station, and Exelon’s Oyster Creek station New Jersey. There are another dozen or so nuclear plants that are at risk of closure. Like FitzPatrick and Pilgrim, which stood to lose as much as $60 million and $30 million, respectively, the at-risk nukes are not economic in current market conditions. So how did a technology once touted as “too cheap to meter” become too expensive to run? While greens may cheer the prospect of a shrinking nuclear power fleet, the demise of the fleet is an example of disruptive technology at work. In this case, the technology is hydraulic fracturing. In many regions of the country, the wholesale price of electricity is set by the price of natural gas, and cheap gas fracked from shale formations is driving many nuclear plants out of the money and into retirement. The other side of that coin is that gas-fired generation will most likely replace most of the lost nuclear capacity. If that happens, CO2 emissions will increase, as will demand for natural gas. In other words, less fission means more fracking. In the highly unlikely scenario that the retiring nuclear plants are not replaced, wholesale electric prices would likely rise because there would be fewer plants able to supply the electricity customers demand. As painful as that might be for customers, the higher prices could provide some benefit. The price differential would put a value on CO2 emissions avoided by the closed nuclear plants. And, not for nothing, customers would learn how much money they saved over the years.